Why did he slaughter him? and those of his brother righteous. Do not be amazed, then, brothers and sisters, if the world hates you. we have confidence in God. Jesus decided to go to Galilee, and he found Philip. Now Philip was from Bethsaida, the town of Andrew and Peter. As soon as that second sibling makes his presence known—whether in utero or by tiny photo from the adoption agency—a mother’s prayers beg that her children will be friends. More than friends, she wants them to be each other’s fiercest advocates, greatest allies, most compassionate consolers. At the first sign that the first one is unhappy over the mere existence of the second, she starts to worry that somehow she’s stirred up sibling angst. If they are great, grand friends until they are teenagers and, quite suddenly, without warning, they begin to act as if they are mortal enemies, she really wonders about Cain and Abel. Cain hates Abel. He is so overcome with envy of his brother that he kills him. When Saint John recounts the story in the First Reading, he is very clear: you don’t have to actually murder your brother to kill him; you just have to fail to love him well. There is no middle ground here. We are all called to lay down our lives for our brothers (or sisters or neighbors or bosses or teachers). The people we encounter in our daily rounds are our brothers. Very few of us will be called to a dying martyrdom. All of us are called to a living martyrdom, a lifetime of tender sacrifice for one another. 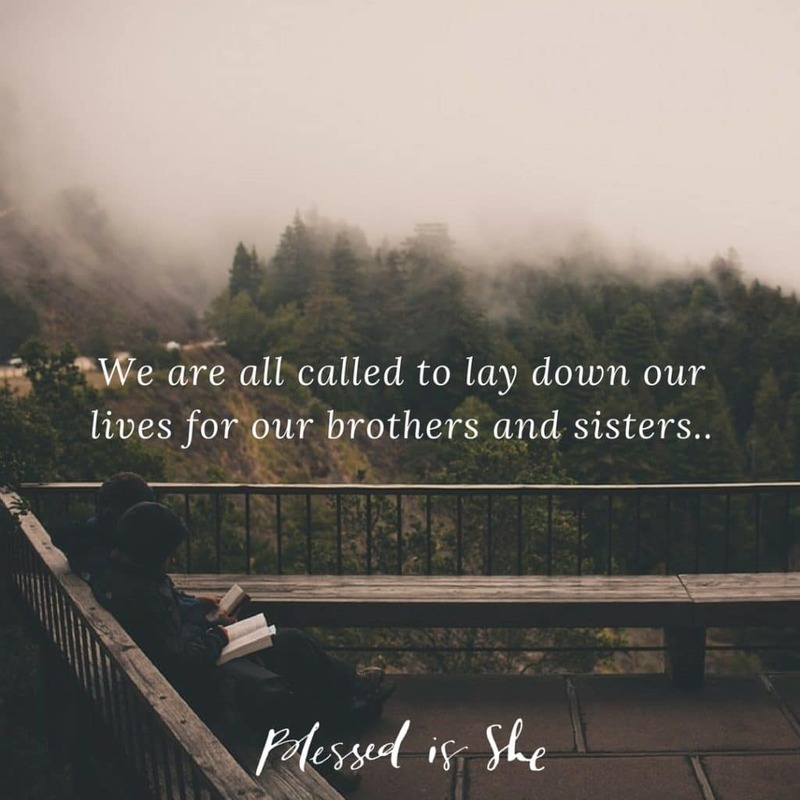 Though it is unlikely we will be called to our deaths for Jesus, we will most certainly be called out of our beds at an uncomfortable hour to meet the needs of another. We will be called from our complacency to speak up for justice. We will be called by another’s hunger to fill a belly. We will be called upon in a myriad of ways to die to ourselves and be the hands and feet of our Savior. Sometimes, we will force ourselves to do the right thing and say the kind thing, only because we love God and do not want to offend Him. Sometimes, we will feel like a six-year-old who wants to hit his little brother over the head with a giant Jenga block, but we will refrain. In those moments, we ask God into our hearts and let Him reside there. We can be confident that He knows the struggle and He knows we’ll fall, but He is merciful and He is good and He will empower us to live more and more like Him. He is calling you to reconcile with your brother (or sister). You know the one. Go! Do that. Elizabeth Foss is a wife, the mother of nine, and a grandmother. She finds the cacophony of big family imperfection to be the perfect place to learn to walk in the unforced rhythms of grace. You can learn more about her here. Previous Post Was that Jesus Who Just Passed By?